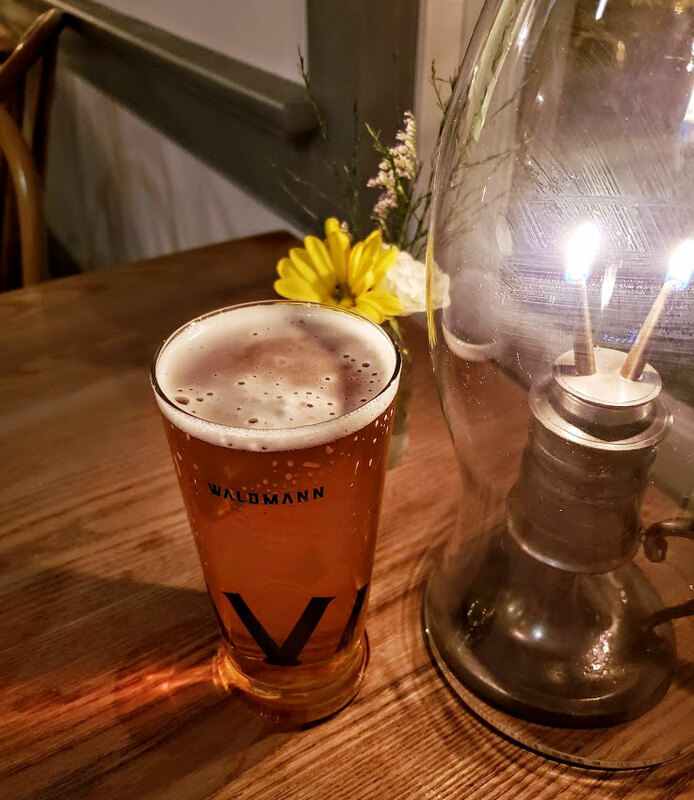 Waldmann Brewery & Wurstery: What to eat and drink. 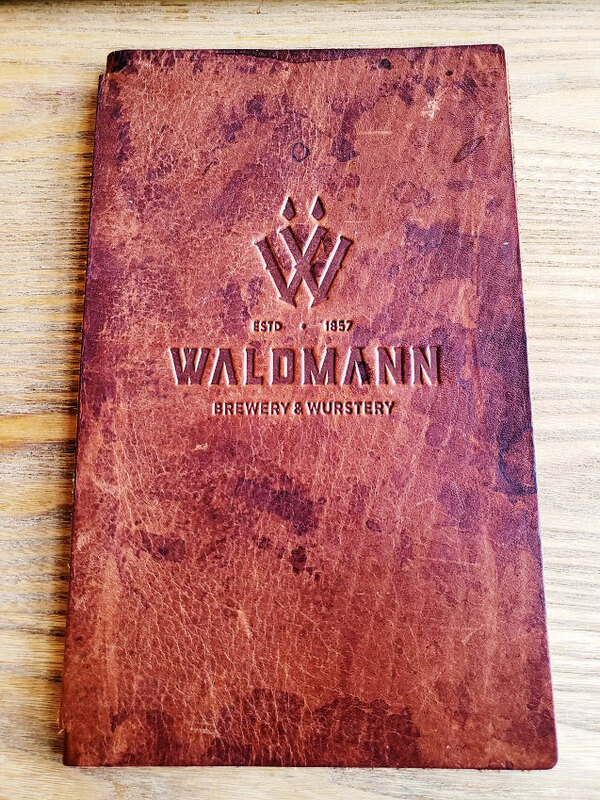 If you ever want to feel like an interdimensional time traveler I suggest a visit to The Waldmann Brewery, a new brewery and “wurstery” off of West 7th in St. Paul, minutes from the Xcel Energy Center. From the moment you lay eyes on the stone exterior with it’s broad, symmetrical face you can tell your brewery experience will be something different. Owner Tom Schroeder would take this as a compliment: the restoration of this 1857 building has been his labor of love for the past ten years. Every aspect of The Waldmann has been restored by hand and with great care. This sense of care is also translated into the food and beer served, making this historic site a place to visit again and again. I’m currently sitting at a simple wood table on the upper floor of the Waldmann, tapping away on the light up keys of my lap top. This makes me feel like a person from the future as I take in my surroundings. I sit across from a black iron stove that boldly claims the center of the room. All that adorns my simple, wooden table is an honest to goodness oil lamp and a tiny vase with tiny, fresh flowers. The top of a built-in book shelf slants with the roof and exposes some of the original stone work. 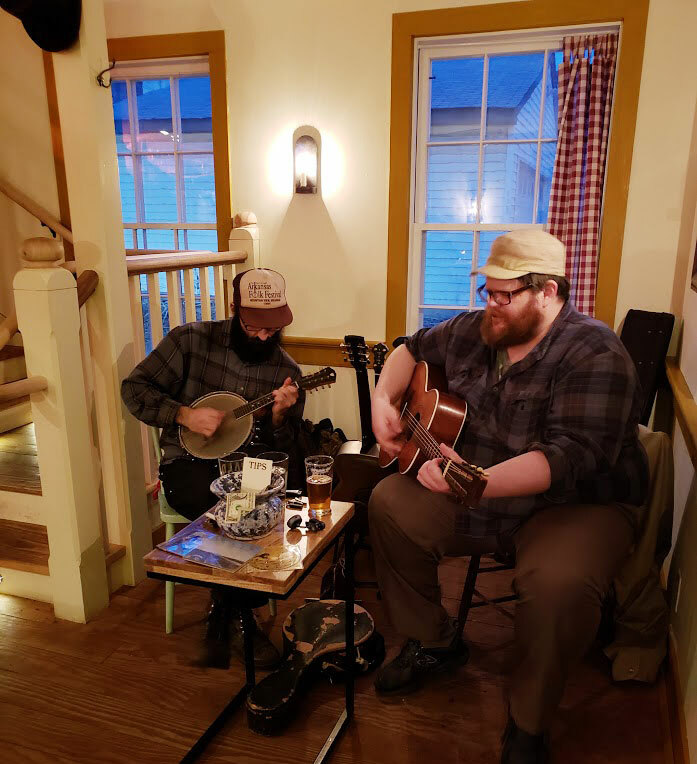 Below me a folk duo picks their banjos and fill the entire building with music. This isn’t hard to do as The Waldmann is more house-like in size and a smaller one at that. Though small, it uses it’s space well. There are four large rooms for a customer to enjoy their time in various ways: at the bar in the “Bierhall,” at a sofa next to the wood stove on the upper floor, in an intimately lit front room down below, or upstairs in a cheery blue room while a buffalo presides over the evening. Any of the decorations, books, framed portraits and paintings are indicative of the era The Waldmann was built in, as are the furnishings and even the paint on the walls. If you have a chance to take a tour, Tom will tell you how the trim was hand-planed, the windows are made of blown glass as they would have back then, and he was even able to strip down to the very first layer of paint and matched it. This attention to detail, down to wooden chairs from the 1800’s, is what makes The Waldmann feel like a different era, even as the waiter swipes your credit card through the reader affixed to their tablet. The Best Wurst (Brats & Sausages are awesome!) 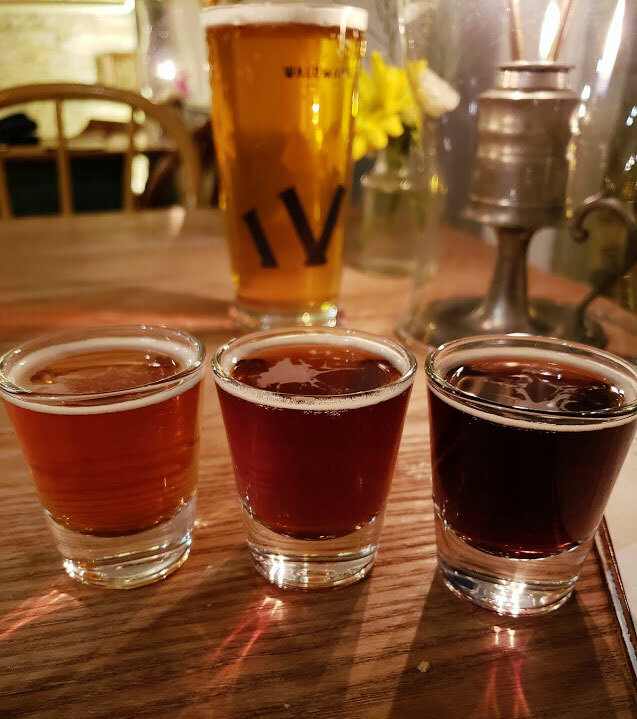 – GERMAN FOOD AT WALDMAN BREWERY! I’m not sure if “Wurstery” is really a word, but The Waldmann Brewery has claimed it for it’s own. Google it and you’ll find entry after entry about this 19th century style saloon and it’s extremely German delicacies. This evening I’ve decided to treat myself to dinner and even dessert and it’s one of the best meals I’ve had. The food is all made in house (except for the pretzels by Aki’s Breadhaus) adding authenticity to their dishes. I choose the frankfurter, cold bacon potato salad, and spätzle. The frankfurter is an encased sausage of pork and beef and described as “fine textured” on the menu. the texture is soft, softer than what you’d probably be used to in a typical wurst or hot dog, and oh so flavorful. Smokey, savory, delicate as well, nicely spiced to where I forget I have home-made condiments to accompany it. My first side, spätzle, is a traditional German pasta dish. It’s egg noodle dough that is scraped or grated into boiling water where the dough forms small clumps as it becomes pasta and rises to the surface of the water. The Waldmann serves their version simply with butter, salt, and pepper. It’s soft and only a little chew to it, much like the texture of scrambled eggs, lovely and light. The cold bacon potato salad is a bit more robust in flavor with hunks of bacon almost like ham, the potatoes are tender but firm, and the dressing is fresh, almost lemony with hints of sour and sweet. Finally, I use my crusty on the outside, chewy and soft on the inside hard roll to taste the mustards. I’m not usually one for mustards but each one was so distinct and flavorful I’m glad I received them with my meal. 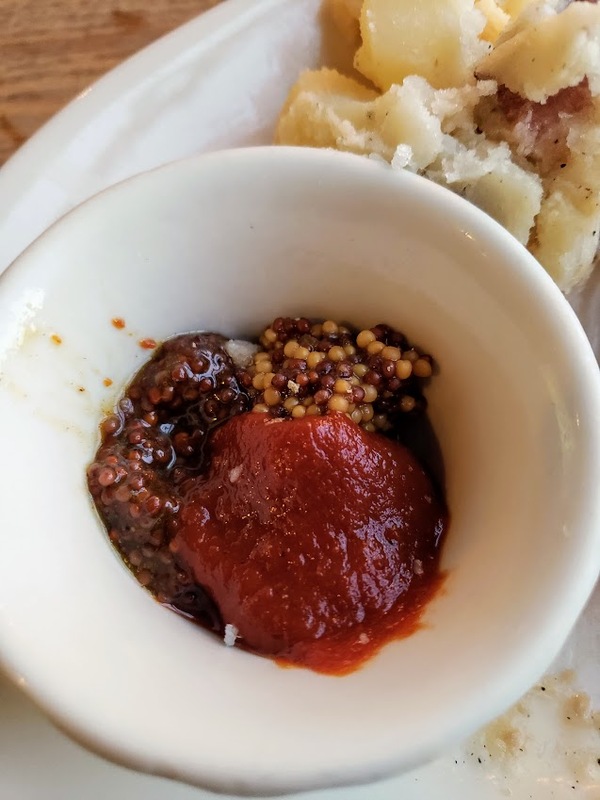 One mustard is deep maroon in color, with a dark fruit sweetness and a sharp spiced flavor that lingers. The multi-colored mustard is spicy and earthy. I break open a small seed with my teeth and it burns my tongue for just a second, and a building sizzle is formed in the base of my throat – incredible! Delicate, fresh, and delicious! Apple Struedel is a must! (note the nutty, vanilla cream custard underneath…heaven! – paired with a Pilsner. The apple strudel is superb as well. It’s nutty, and the apple is paired with golden raisins. The vanilla cream custard sauce is so perfect and velvety smooth, tastes like melted homemade whip cream. There is a light, chewy texture to the crust that holds just a hint of sweetness to balance out the tart, tender apples it holds. This item is also featured on the Waldmann’s brunch menu with full coffee service. At last we reach the beer. Here at The Waldmann Brewery you will find some of the best and truest to style German beers in town. This is where to come if you seek something malty but not heavy, balanced and sessionable ales. The five beers on the menu each represent different traditional styles, with the newest style dating back to the 1850s. Meant to be drunk easily and often without fear of wearing out your tastebuds, you won’t find any hop, juice, or fruit bombs here and the ABV ranges between 4%-5.5%. My favorite of the evening is the schokoladeweizen, or chocolate wheat beer. This is probably the best beer I could have chosen to go with my meal. It’s slightly carbonated, the color of coffee but a light mouthfeel with subtle hints of chocolate and caramel malts. Alongside this are the slightly earthy notes that barley brings, not a sweet beer but not sour or dank or spicy, just smooth. The wheat seems to elevate and ground it at the same time. This having the body of a wheat beer with traditionally dark beer flavors makes this interesting to your palate and seems to heighten both the sweet and savory aspects of the food. 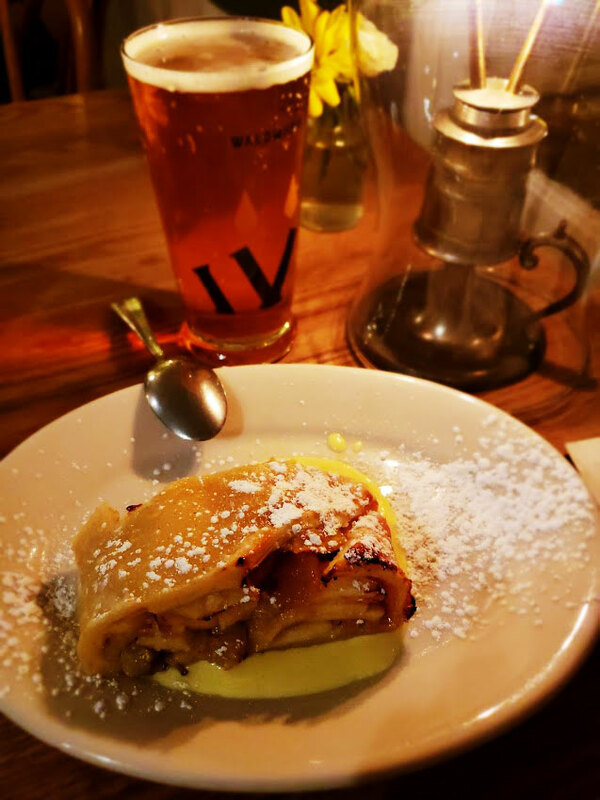 Later I pair the Pilsner with my strudel, the bright, crisp notes of the beer bouncing off the vanilla cream and deepening the tartness of the baked apple. And since none of these are palate breakers you know that if you enjoy one you will likely enjoy all five. Brittany is kind enough to take a few moments and sit with me now that the dinner rush is over and patrons have settled in to enjoy the live music. 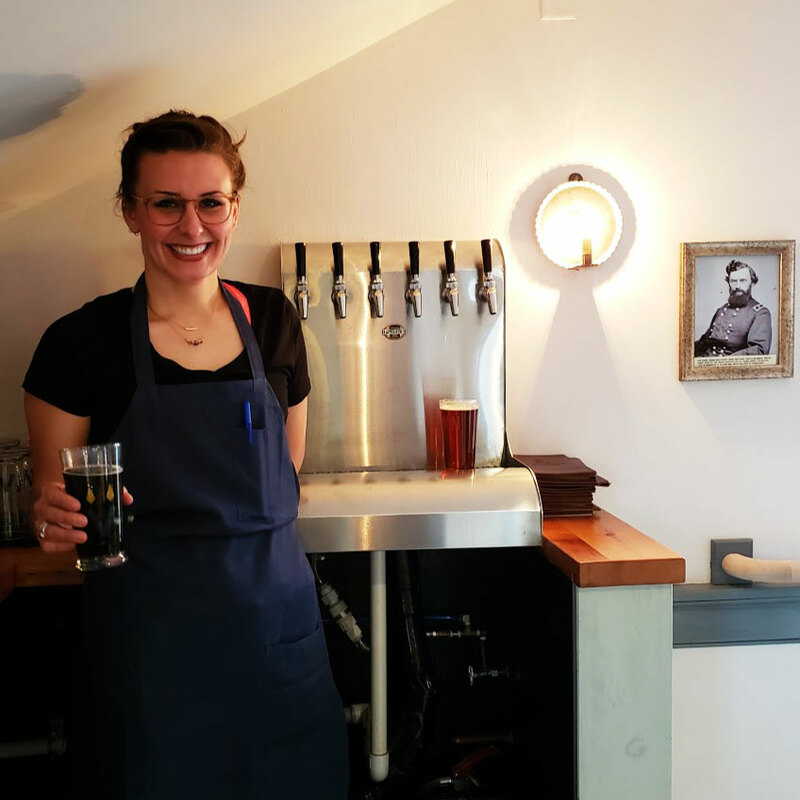 Brittany started at the Waldmann Brewery when it opened just this past October 2017. Usually a cook, she has been enjoying her role on wait-staff and watching as neighborhood locals become regulars and visitors from outside of St. Paul accumulate. The history and the many groups involved in the making of this establishment drew her to The Waldmann Brewery and she seems to learn something new every day. 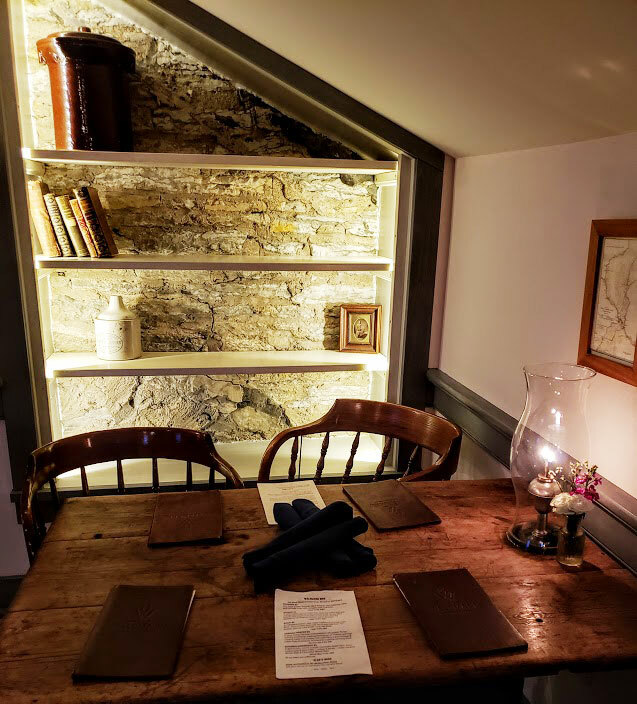 According to Brittany, the owner, Tom, is constantly revealing something new about the building and it’s history, and she loves working with him and the rest of the staff. In many ways she feels The Waldmann Brewery exemplifies what she loves about the beer scene in MN: that so many breweries are rooted in beer history and/or beer education. To Eat? Favorite item on the menu is currently the weisswurt, a rotating specialty wurst. 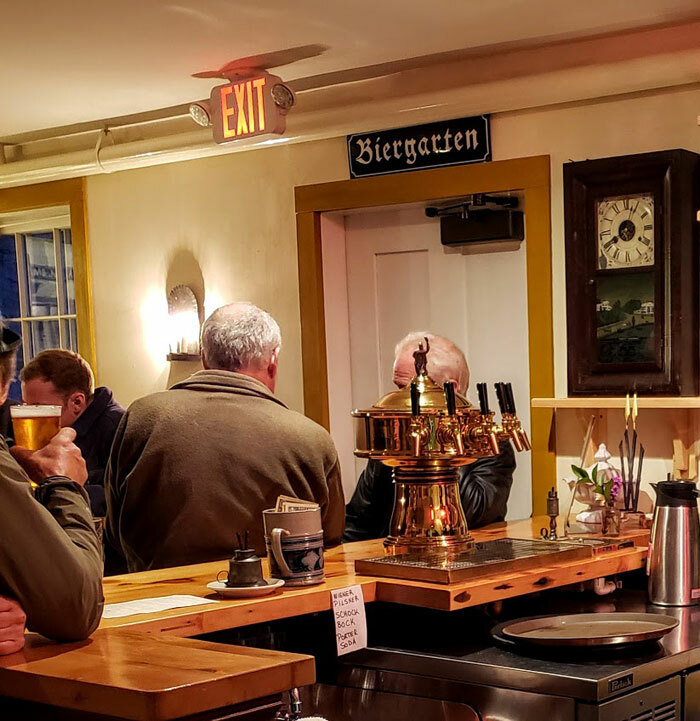 For a historic site The Waldmann Brewery is adding new things to it’s services including a brunch started at the end of March and a coffee and tea service. They are also working on a beer garden to be premiered this summer if all of the preservation hearings go well, something that Tom later assures me have been unanimously in favor of it. As far as thrift is concerned The Waldmann Brewery is easy on the wallet without having to get your timing right. Shareable platters, referred to as “planks” allows you and friends to try the many offerings of traditional cuisine and all pints are only $5. And if you care to take beer history home you can get three 32oz crowlers to go for $25. The Waldmann is a registered historic building and a hidden gem of St. Paul. Just minutes away from the hustle and bustle that surrounds the Xcel Energy Center you can step back in time and enjoy authentic German inspired cuisine and a small selection of exceptional beer. Super Troopers Hang, Free Beer in NE!